A BTS skytrain passing the Sathon area of Bangkok. Bangkok, known in Thai as Krung Thep Maha Nakhon (IPA: [kruŋtʰeːp mahaːnakʰɔn], กรุงเทพมหานคร ▶) or Krung Thep (กรุงเทพฯ ▶) for short, is the capital and the largest city of Thailand. Bangkok is located on the banks of the Chao Phraya River, near the Gulf of Thailand. Bangkok is the 22nd most populous city in the world, with a recorded population of 6 million; the actual number is thought to be higher. The city is a major economic and financial center of Southeast Asia. In 2005, it produced a GDP (PPP) of about USD 220 billion, which accounts for 43 percent of the country's GDP. Its GDP (PPP) per capita is well over USD 20,000, one of the highest in Southeast Asia. The Stock Exchange of Thailand (SET) is located in Bangkok, with over 400 listed companies and combined market capitalization of about THB 5 trillion (USD 120 billion) as of January 5, 2006. Bangkok has one of the fastest rates in the world for construction of high rise buildings. The city's wealth of cultural sites makes it one of the world's most popular tourist destinations. 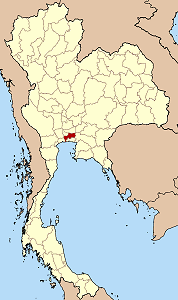 The Bangkok Province borders six other provinces: Samut Prakan, Samut Sakhon, Chachoengsao, Pathum Thani, Nonthaburi and Nakhon Pathom. The town of Bangkok (บางกอก ▶) began as a small trading center and port community on the west bank of the Chao Phraya River serving the Ayutthaya Kingdom, the precursor of modern Thailand, which existed from 1350 to 1767. It is believed that the town's name derived from either Bang Makok, bang being the Central Thai name for towns or villages situated on the bank of a river, and makok (มะกอก) being the Thai name of either Spondias pinnata (L.f.) Kurz, Spondias mombin, or Elaeocarpus hygrophilus Kurz (both plants produce olive-like fruits); or Bang Koh, koh meaning "island," a reference to the area's landscape, which was carved by rivers and canals. 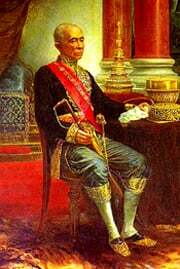 After the fall of Ayutthaya to the Burmese Kingdom in 1767, the newly declared King Taksin established a new capital in the area of then-Bangkok, which became known as Thonburi. When Taksin's reign ended in 1782, King Buddha Yodfa Chulaloke reconstructed the capital on the east bank of the river and gave the city a ceremonial name (see below) which became shortened to its current official name, Krung Thep Maha Nakhon (which means "city of angels"). The new city, however, also inherited the name Bangkok, which continued to be used by foreigners to refer to the entire city and became its official English name. In Thai, the name “Bangkok” still refers only to the old district on the west bank of the river. The city has since vastly modernized and undergone numerous changes, including the introduction of transportation and utility infrastructure during the reigns of King Mongkut and King Chulalongkorn, and has quickly developed into the economic center of Thailand. Part of the Bangkok skyline at night. The full ceremonial name of the city given by King Buddha Yodfa Chulaloke, and later edited by King Mongkut, is Krung Thep Mahanakhon Amon Rattanakosin Mahinthara Yuthaya Mahadilok Phop Noppharat Ratchathani Burirom Udomratchaniwet Mahasathan Amon Piman Awatan Sathit Sakkathattiya Witsanukam Prasit (กรุงเทพมหานคร อมรรัตนโกสินทร์ มหินทรายุธยามหาดิลกภพ นพรัตน์ราชธานี บุรีรมย์อุดมราชนิเวศน์มหาสถาน อมรพิมานอวตารสถิต สักกะทัตติยะวิษณุกรรมประสิทธิ์). This ceremonial name is composed in a combination of two ancient Indian languages, Pāli and Sanskrit. According to the Romanization of these languages, it can be written as Krung-dēvamahānagara amararatanakosindra mahindrayudhyā mahātilakabhava navaratanarājadhānī purīrāmasya utamarājanivēsana mahāsthāna amaravimāna avatārasthitya shakrasdattiya vishnukarmaprasiddhi. It translates to "The city of angels, the great city, the eternal jewel city, the impregnable city of God Indra, the grand capital of the world endowed with nine precious gems, the happy city, abounding in an enormous Royal Palace that resembles the heavenly abode where reigns the reincarnated god, a city given by Indra and built by Vishnukam." Local school children are taught the full name, although few can explain its meaning because many of the words are archaic, and unfamiliar to all but a few scholars. Most Thais who can recall the full name do so as a result of its use in a popular song (กรุงเทพมหานคร/Krung Thep Mahanakhon by อัสนี-วสันต์ โชติกุล/Asanee-Wasan Chotikul 1989), and will often recount it by recalling the song at the same time, much in the same way that English speakers might sing the alphabet song while reciting the English alphabet. The full name of the city is listed by Guinness Book of Records as the world's longest place name. 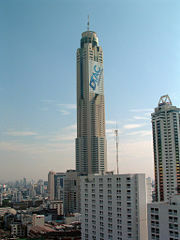 The Baiyoke Tower II, Thailand's tallest building and hotel. Bangkok is the economic center of Thailand, dominating the country's economy and dwarfing other urban centers. In 2005, it produced a GDP (PPP) of about USD 220 billion, which accounts for 43 percent of the country's GDP. Its GDP (PPP) per capita is well over USD 20,000, one of the highest in Southeast Asia. The Stock Exchange of Thailand (SET) is located in Bangkok, with over 400 listed companies and combined market capitalization of about THB 5 trillion (USD 120 billion) as of January 5, 2006. Due to the large amount of foreign representation, Thailand has for several years been a mainstay of the Southeast Asian economy and a key center of Asian business. In the recent mini-crash on December 17, 2006, known as Black Tuesday, the SET lost over THB 800 billion or USD 25 billion in value, causing markets in the Asia-Pacific region to fall and having a global impact. The loss of market valuation evoked fears of a repeat of the Asian Financial Crisis of 1997; however, a partial policy reversal saw market regain nearly all of its losses. Bangkok is home to the headquarters of all Thailand's large commercial banks and financial institutions; 18 financial institutions hold at least USD 1 billion in total assets. Their bank deposits totaled approximately THB 7 trillion (USD 177 billion) at the end of the third quarter in 2005. Many transnational companies operate regional headquarters in Bangkok, because the cost of operation in the city is less than in most rival cities in Asia. Thirteen Bangkok-based companies are on the Forbes 2000 list, including the largest Thai bank, Bangkok Bank, and the country's largest energy company PTT. Tourism is a significant contributor to Thailand's economy, providing about five percent of GDP. Bangkok is Thailand's principal international gateway, the major domestic hub, and a destination in its own right. Income inequality among Bangkok's residents is significant, especially between relatively unskilled lower-income immigrants from rural provinces in Thailand and neighboring countries, and wealthier government officials, middle class professionals, business elite, and retired foreigners. About 7 percent of Bangkok's population (excluding illegal immigrants who constitute about 5-8 percent of population) lives below the poverty line compared to the national average of 9 percent. As of the 2000 census, there were 6,355,144 registered residents in the city. However, this figure does not take account of the many unregistered residents and daytime visitors from the surrounding metropolitan area. Recently, Bangkok has experienced a large influx of foreign immigrants, long-term residents, and expatriates. The number of expatriate executives stood at 65,000 as of November, 2005, with an average of more than 1,800 permits issued per month. Long-term foreign residents include 250,000 mainland Chinese, 30,000 Japanese (the largest community in any Asian city outside of Japan), 100,000 Indians (35,000 Sikh), of whom more than 80 percent have Thai citizenship, 6,000 Americans, 45,000 Europeans (the second largest number in any Asian city after Singapore),15,000 Taiwanese, 7,000 South Koreans, 6,000 Nigerians, 8,000 people of Arabic speaking countries, 20,000 Malaysians, and 4,000 Singaporeans. There are approximately 400,000 - 600,000 illegal immigrants from Cambodia, Myanmar, Russia, Ukraine, Pakistan, Nigeria, India, Bangladesh, China, and other countries. A vast majority of the population, 92 percent, is Buddhist. The rest are Muslim (6 percent), Christian (1 percent), Jewish (300 residents), Hindu/Sikh (0.6 percent), and others. There are some 400 Buddhist temples, 55 Islamic mosques, 10 Christian churches, 2 Hindu Temples, 2 synagogues and 1 Sikh gurudwara in Bangkok. Bangkok province covers 1,568.7 km², making it the 68th largest province in Thailand. Much of the area is considered part of the city of Bangkok, making it one of the largest cities in the world. The Chao Phraya River, Thailand's longest river, which stretches 372 km (231 mi), is Bangkok's main geographical feature. The Chao Phraya River basin, the area surrounding Bangkok, and the nearby provinces comprise a series of plains and river deltas that lead into the Bay of Bangkok about 30 km (18.6 mi) south of the city center. This gave rise to Bangkok's appellation as the "Venice of the East" due to the number of canals and passages that divide the area into separate patches of land. The city once used these canals, which were plentiful within Bangkok itself, as divisions for city districts. However, as the city grew in the second half of the twentieth century, the plan was abandoned and a different system of division was adopted. Bangkok lies about two meters above sea level, making the city vulnerable to flooding during the monsoon season. Often after a downpour, water in canals and the river overflows the banks, resulting in extensive floods. The Bangkok Metropolitan Administration (BMA) has recently installed higher barriers alongside some canals to keep water levels from reaching street level. The city is rumored to be sinking an average of two inches a year, as it lies entirely over a swamp. Some reports say that the city is sinking as much as four inches a year, and this, combined with the rising sea level, will leave Bangkok under 50 cm to 100 cm (20 to 40 in) of water by 2025. Bangkok has a tropical monsoon climate under the Köppen climate classification system. Bangkok is said to have the highest average temperature of any city in the world. Average temperatures in the city are about 2°C higher than the ones shown for the Don Muang Airport at 1960-1990 period. Absolute maxima is 40.8°C (105.44° F) and absolute minima is 10.0°C (50° F). The coldest temperatures were recorded in January 1924, January 1955, and January 1974. Bangkok is one of two special administrative areas in Thailand, the other being Pattaya, in which citizens choose their governor by election, unlike in Thailand's 75 other provinces (changwat). The urban sprawl of the greater Bangkok Metropolitan Area extends beyond the borders of Bangkok province, spilling into the neighboring provinces of Nonthaburi, Samut Prakan, Pathum Thani, Nakhon Pathom and Samut Sakhon. The province as it is today was created in 1972, when the previous Bangkok province, changwat Phra Nakhon, merged with Thonburi province. 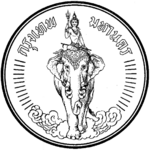 The seal of the city shows the god Indra riding in the clouds on Erawan, a mythological elephant-shaped creature. In his hand Indra holds a lightning bolt, which is his weapon to drive away drought. The seal is based on a painting done by Prince Naris. The tree symbol of Bangkok is Ficus benjamina. Bangkok is subdivided into 50 districts (khet, also sometimes called amphoe in the other provinces), which are further subdivided into 154 kwaeng (แขวง, equivalent to tambon in other provinces). Each district is managed by a district chief appointed by the governor. District councils, elected to four-year terms, serve as advisory bodies to their respective district chiefs. There is also an elected Bangkok Metropolitan Council, which has power over municipal ordinances and the city's budget. The last elections for local councils in Bangkok were held on July 23, 2006. Throughout the years, Bangkok has grown from a city scattered along the river to a metropolitan area that spans as many as six provinces. The city's main business districts and residential areas are continuously expanding. The influx of foreigners from Western countries as well as immigrants from neighboring Laos, Myanmar, Cambodia and many other South Asian countries along with the growth of the Thai population has spurred the construction of hundreds of housing projects around the metropolitan area, developing communities along the outskirts. Within a few years, these new communities have become successively engulfed by greater Bangkok. The most important business districts of Bangkok include Silom, Bangrak, Pinklao, Sathon, Phra Ram 2, Petchaburi, Phra Nakhon, and Pathumwan. As the city expanded on the outskirts, the inner city grew upwards. The city has 1000 skyscrapers and ranks 17th as the world's tallest city. This does not include hundreds of new buildings predicted as part of the construction boom in 2007 and the coming years. 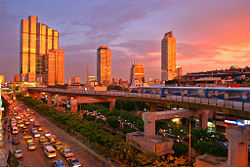 Areas such as Silom-Sathon and Asok have been Thailand's business center for decades. During the 1990s, as Thailand experienced the world's highest growth rates and underwent an economic transformation, Bangkok went through dramatic changes. The Ratchadaphisek area was turned into a business district which continued through the Asok area for five kilometers to the north. The Sukhumvit area, stretching 15-20 km (9 – 13 mi), gradually turned into a mixed commercial and residential area. Some of Bangkok's most expensive real estate is in Wireless Road and Chitlom. Part of the British Embassy, on the corner of Wireless and Rama I Roads, nine rai or approximately 14,400 m² in area, sold for USD 92 million or THB 3.24 billion, and is the most expensive single sale of land on record in Thailand. Most governmental agencies and ministries have their offices in Bangkok's Phra Nakhon district alongside Dusit. Most of the well-known tourist attractions are also in this area, due its age. It has been designated a no-skyscraper zone to preserve the historical character of the area, where some buildings are as old as Thailand itself. This part of Bangkok contains the most notable tourist attractions, such as the Grand Palace, Democracy Monument, Giant Swing, and Sanam Luang. Thon Buri also has a number of historic monuments, such as Wat Arun, mainly located near the river. The Victory Monument in Bangkok is one of the city's biggest bus destinations. Although not officially a bus depot, its location in the center of city transits as many as 20 bus lines, as well as a BTS Skytrain station. Bangkok's north and eastern areas are primarily residential areas for middle class residents of Bangkok. Whereas the inner city often has small apartments and low rise buildings for poor immigrants, Lad Prao and Sri Nakarin offer residential compounds and townhouses. The two areas cover as much as 100 km²-150 km² (62 mi² – 93 mi²)each, and have become part of inner Bangkok as more suburban housing developments have been constructed further out to the east and north. The west of Bangkok, Thon Buri, is another area of growth, rivaling the development experienced by the north and east. Suvarnabhumi Airport in the east is seen as a jump start for the eastern expansion of Bangkok, as Don Muang was for the north. Ratchaprasong is at the foremost shopping area of Bangkok. The newly renovated Central World Plaza is intended to serve as a square to Bangkokians. Just up the street is Siam Square, similar to Shinjuku in Tokyo and Oxford Street and Picadilly Circus in London. 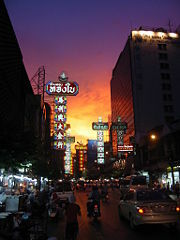 The Sukhumvit area also serves as a shopping district for foreigners. The popular Chatuchak Weekend Market in the north of the city is where many people head for cheap, quality products. Bangkok's poorest districts are spread throughout the city. However, the most concentrated area is just north of the Port of Bangkok at the turn of the Chao Phraya River. For an area of ten km² (six mi²) , the Khlong Toei district houses one of the poorest areas in the country, with half-built houses and mid-rises for immigrants and workers from the northeast Isan provinces. Bangkok has large areas of greenery, either preserved by the Department of National Forestry or designated as "green zones." Bangkok is known for its large green sections within the city center, including a large forest park between Yannawa and Samut Prakan. This part of the city covers an area of over 50 km² (31 mi²). and is intended to buffer the CBD from the large industries of the west and south of Metropolitan Bangkok. Other areas include Bung Makkasan, an urban city buffer for residences, and sections of many major roads which have undeveloped swamps and green fields. Some of these areas are intentionally undeveloped to protect against urbanization, while others were remain undeveloped as a result of the Asian Financial Crisis. Lumphini Park, renowned as Bangkok's Central Park, was built in the early 1900s by Rama VI. It has been used to hold grand pageants and ceremonies of the Thai constitution, and was a camp for Japanese soldiers during World War II. The park's primary function is now recreational, and it is one of the most visited parks, especially on weekdays. Chatuchak Park and Rama IX Park, built in the past 50 years, are two of Bangkok's largest parks. They cater to Bangkok's suburban population and include botanical gardens; sports clubs and complexes; English, French, and Japanese gardens and parks; and large ponds and lakes. Other famous parks include Queen Sirikit Park near Lad Yao, Benjasiri Park on Sukhumvit, Saranrom Park across from the Grand Palace, Sanam Luang, Suan Romaneenat, and Dusit Park. There are a large number of private and public universities in Bangkok, including Thailand's oldest university, Chulalongkorn University. There are also several Rajabhat universities, which formerly were part of the teacher's college system. Bangkok is considered to be one of the world's tourist hotspots, and is currently Asia's top tourist destination and the third in the world according to Travel and Leisure magazine. Bangkok is Thailand's major tourist gateway, which means that the majority of foreign tourists arrive in Bangkok before proceeding to coastal and inland resorts. An estimated 15 million foreigners arrive in Bangkok every year. The city boasts some of the country's most visited historical venues such as the Grand Palace, Wat Pho, and Wat Arun. There are numerous projects to maintain Bangkok's historic sites in the Rattanakosin area and river districts. Chakri Maha Prasat Throne Hall, a nineteenth century styled building with a traditional Thai stucco roof, located within the Grand Palace compound. Wat Arun, one of the most visited temples in Bangkok. The Bangkok Metropolitan Area is home to two capitals of Thailand: the area historically known as Rattanakosin, and the modern Bangkok. There are a large number of palaces in Bangkok. Several are still in use by the Thai royal family, while others are now open to the public and some have become government buildings or universities. The king's official residence is the Grand Palace, which dates to 1782 and has housed Thailand's monarchs for over 150 years. Up to the early twentieth century and before the 1932 Revolution, the complex was central to Thai government; it included royal courts, administrative branches, and was similar in layout to that of previous Thai capitals. Today, it is one of the most visited locations in Bangkok. Within the complex are the Chakri Mahaprasat Hall, and Wat Phra Kaew, which houses the Emerald Buddha and is considered the most important temple in Thailand. Chitralada Palace is the Bangkok residence of King Bhumibol Adulyadej (Rama IX) and Queen Sirikit. Of the hundreds of wats located in Bangkok, only a few are notable. When King Taksin led his troops out of Ayutthaya and into Thon Buri, they took refuge in Wat Arun. This pre-Thonburi- era structure rises to 85 meters and has held the status of tallest structure in Bangkok for longer than any other modern skyscraper. Wat Pho, which houses the Temple of the Reclining Buddha or Wat Phra Chetuphon, is located behind the Temple of the Emerald Buddha in the Grand Palace. It is the largest temple in Bangkok and named for its huge reclining Buddha, which measures 46 meters long and is covered in gold leaf. The Buddha's feet alone are three meters long. Wat Suthat is one of the oldest temples and the site of the original Giant Swing. A huge teak arch, all that remains of the original swing, lies on the grounds in front of the temple. The swing was used in a ceremony to give thanks for a good rice harvest. Within Wat Saket is the Golden Mount, or Phu Khao Thong, an unusual temple that houses Buddha relics within its 58-metre-high chedi, surmounted by a golden cupola. Built by King Rama I just outside the new city walls, the late-eighteenth century temple served as the capital's crematorium. During the next hundred years, the temple became a dumping ground for some 60,000 plague victims. The Oriental Bangkok, one of the oldest and most luxurious hotel in Bangkok. A number of deluxe hotels can be found in Bangkok, such as the Peninsula Bangkok, which recently made the Top 10 in Travel and Leisure magazine's Top 100 hotels list, listed as #4, while the Oriental Hotel claimed the ninth spot. Sukhumvit Road hosts a series of international chains such as JW Marriot, The Landmark, Intercontinental, Sheraton, and The Davis. The Banyan Tree on Sathon, one of Bangkok's tallest hotels, featured the tallest bar and restaurant in the city, Vertigo, up until the launch of Sirocco on top of State Tower, 247 m above the bustling streets of Bang Rak. There are large numbers of cheaper hotels scattered throughout the city, most notably in Khao San Road, and a fast-growing number of bed and breakfasts adapted to suit the Asian lifestyle can be found in Phloenchit, Watthana and Khlong Toei. Thailand has a variety of shopping experiences from street markets to malls. Tourists have historically always preferred markets and bazaars to the other forms of shopping. The Chatuchak weekend market is one of the largest shopping destinations in Bangkok. Water markets are gradually disappearing, but remain popular tourist attractions as many tours are offered through the canals where the markets are located. Siam Paragon is one of the biggest shopping malls in Asia. The huge new shopping complex known as Siam Paragon, and CentralWorld on Rama I Road in Bangkok's city center, are among the biggest and most luxurious malls in Southeast Asia. Boats and ferries near the Rama VIII Bridge. An elaborate network of canals known as khlongs gave Bangkok the nickname "Venice of the East" at a time when most transportation was by boat. Today, nearly all of the canals have been filled in and converted into streets. While many khlongs still exist, with people living along them and markets often being operated along the banks, most are severely polluted. A notable khlong market is the floating market in Taling Chan district. Through downtown Bangkok runs the Khlong Saen Saeb, which has a canal boat service, the most extensive of which is the Chao Phraya Express Boat, with as many as 30 stops along the both banks of the Saen Saeb. However, there are limitations, as towards the north, the stations are farther and farther apart, impeding the ability of the water taxi to function as a true mass transit system. 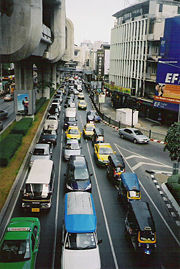 Several elevated highways, newly rebuilt intersections, and many partially finished road and rail projects dot the landscape around greater Bangkok, but have done little to overcome the notorious traffic jams on Bangkok's surface roads, as private vehicle usage continues to outstrip infrastructure development. Many city residents complain that they spend more than half their waking day on the streets on an open-air city bus. In 1999, an elevated two-line Skytrain (officially called BTS) metro system was opened. The remains of a failed elevated railroad project (the Hopewell project) can still be seen all the way from the main railroad station out towards Don Mueang Airport. Due to the Asian financial crisis, construction was halted and the concrete pillars were left unused. A Skytrain approaching Sala Daeng Station. The MRT subway system opened for use in July 2004. The MRT connects the northern train station of Bang Sue to the Hua Lamphong central railway station near the city center, and passes through the eastern part of Bangkok..
For intercity travel by train, most passengers begin their trips at Hua Lamphong at the southern end of the MRT. Here, trains connect Bangkok to Malaysia in the south, Chiang Mai to the north, and Nong Khai and beyond to the northeast. Virtually all cities and provinces are easily reached by bus from Bangkok. Concourse D at Suvarnabhumi International Airport as seen from a taxiing plane. Bangkok is one of Asia's most important air transport hubs. In 2005, more than ninety airlines served Don Mueang International Airport (IATA: DMK; ICAO: VTBD), over 38,000,000 passengers, 160,000 flights and 700,000 tons of cargo are handled at this airport. It was the 18th busiest airport in the world, second busiest in Asia by passenger volume, 15th busiest in the world and fourth busiest in Asia in international passenger volume. Don Mueang consistently ranked 19th in the world in cargo traffic, and seventh in the Asia-Pacific region. Don Mueang is considered to be one of the world's oldest international airports, its opening in March 1914 making it almost 20 years older than London Heathrow. It has three terminals and is located about 30 km north from the heart of Bangkok. On September 28, 2006, Suvarnabhumi Airport (IATA: BKK; ICAO: VTBS), became Bangkok's official international airport, replacing Don Mueang. Pronounced Suwannaphum (RTGS), or loosely Su-wan-na-poom, the airport is located southeast of the city center in Bang Phli district, Samut Prakan Province. The airport features a 132.2 meter-tall control tower, the tallest in the world and one meter taller than Kuala Lumpur International Airport control tower. Airports of Thailand Plc. (AoT) have announced another terminal to accommodate a further fifteen million passengers. This will be part of Phase 2 of the airport, which is expected to begin construction in three to five years. The main airline of Suvarnabhumi is Thai Airways International. Don Mueang remains in use as a base of the Royal Thai Air Force. Thai Airways, and most of the low-cost airlines now use the airport for domestic flights, in an effort to ease congestion at Suvarnabhumi, until the next terminal is opened. With more than five and a half million registered vehicles, Bangkok has long been notorious for its massive traffic jams, which are still a serious problem. The recent construction of the elevated second-level, third-level and fourth-level expressways, many tunnels and flyovers, BTS and MRT systems, four new SRT lines BRT Bangkok has eased some of the congestion along specific corridors, but has done little to alleviate overall congestion. The major reason is the continued popularity of private automobiles, and extensive consumer credit for automobile purchases. Air pollution, largely from traffic and dirt left on streets from construction projects, was a major problem. However, with cooperation between the local government and the residents and the increase in new parks, gardens and open spaces around the city, today Bangkok has cleaner air than in the past. Industrial pollution has also contributed to poor air and water quality. Though sulfur dioxide and ozone levels have fallen substantially, PM (particulate matter) still exceeds health standards in some areas. There have been efforts to clean up Bangkok's canals, many of which are dangerously polluted, through biological means, such the use of water hyacinths, a plant commonly found in the waterways, to cleanse the water of pollutants. However, the large volume of trash in the canals must be cleaned out by other means. Mold growth is ubiquitous in Bangkok, as the wet tropical climate makes it grow, and many residents simply ignore it. As in many other Asian cities, the sale of illegally copied copyright-protected material, mostly software and DVD movies, is widespread in Bangkok, but technically illegal. Although attempts have been made to cracking down on illegal activities over the years, illegal copying of copyrighted material is still a thriving business. Prostitution in Thailand is technically illegal, but can be found all over Bangkok in vast numbers of massage parlors, saunas, parks, and hourly hotels, serving foreign tourists as well as locals. Locals, hotel workers, and officials often turn a blind eye towards such behavior and allow it to continue to flourish. Foreign residents and tourists alike complain of widespread scams and blatant price gouging. Pick-pocketing and petty theft are common crimes in Bangkok. There are an average of four million readers for more than 25 Bangkok-based newspapers, the largest claiming to be Thai Rath, which sells over a million copies a day. Bangkok also has two major English-language dailies, the Bangkok Post, probably the most famous, followed by The Nation. The Asian Wall Street Journal and International Herald Tribune are printed in Bangkok and have high distribution numbers. There are also a number of weekly publications normally published on Fridays that deal with political issues. Other publications, such as lifestyle and entertainment magazines are also plentiful. Modern youth are turning to more Westernized magazines and publications dealing with fashion, the superstar life, and glamour. There are a large number of paparazzi magazines and fashion publications, especially since the launch of the Bangkok Fashion City project in 2004. Since then, United Broadcasting Corporation (UBC, now True Visions), the Thai cable operator, has launched a new channel devoted to Thai fashion as well as a Thai edition of E! Entertainment television. Five television stations operated and controlled by the government and the UBC cable operator are based in Bangkok, broadcasting a total of 50 channels, including many Thai television stations such as TITV, six sports channels, and Channel V. There are more than 30 FM radio stations within the Bangkok metro vicinity and 50 AM channels, including international brands such as Virgin Radio. Radio stations mainly broadcast in Thai, although some broadcast solely in English due to the growing expatriate population. Clubs featuring jazz and other live music line the streets in districts around Victory Monument, the entire BTS Sukhumvit line, and Phra Nakorn. Chalerm Krung Theater and the National Theater have been in operation since the early twentieth century, and the newer Thailand Cultural Center hosts a variety of plays and events. The Bangkok Symphony Orchestra and Bangkok Opera are gradually earning recognition among international critics and regularly host performances by international performers. There are also a large number of "cafes," or nightclubs, which host comedy acts along Rama IX Road. Bangkok has dozens of cinema multiplexes, and the city hosts two major film festivals annually, the Bangkok International Film Festival and the World Film Festival of Bangkok. Bangkok is home to the National Gallery of Thailand. Although, it is one of Asia's most important cities economically, the urban pace of Bangkok is somewhat relaxed, as the city offers many opportunities for leisure activities. Most residents suffer because of the amount of traffic in the city; peak hours are between 6:30 A.M. to 9:30 A.M. and 4:30 P.M. to 8:00 P.M. on weekdays, with generally heavy traffic on Fridays and Saturdays. A good number of Bangkokians leave town on weekends to visit seaside resorts such as Hua Hin and Pattaya. Others return home to visit elderly relatives in Isan and the northern provinces. Bangkokian youth tend to stay within the city and use the weekends to relax. Saturdays are often utilized for work or study. Religion does not play an influential role in the capital in contrast to other cities. However, a good proportion of the population remains devout and offers alms daily to the Buddhist monks who walk their neighborhoods. Muslims are either assimilated entirely in the city, or live in remote areas such as the traditional Thai Muslim district of Nong Chok. ↑ Bangkok Post, "Maori claims world's longest place name," 1 September 2006. Retrieved December 19, 2007. ↑ "Calculated Average Height of the Ten Tallest (CAHTT), UltrapolisProject.com. Accessed on March 26, 2007. ↑ History of Chulalongkorn University Accessed June 16, 2007. ↑ World's Best Awards 2006, Top 10 Cities Overall Travel & Leisure. Accessed June 15, 2007. ↑ World's Best Awards 2006, Top 100 Hotels Overall Travel & Leisure. Accessed June 18, 2007. ↑  Accessed June 17, 2007. ↑ "In With the Old," Aviation Week & Space Technology, January 1, 2007. ↑ About Thai Rath. Retrieved December 19, 2007. Blofeld, John, Eaton Calthorpe, and Philip Jones Griffiths. 1979. Bangkok. Amsterdam: Time-Life Books. Ridout, Lucy, and Paul Gray. The Rough Guide to Bangkok, 4th ed. 2007. ISBN 184353780X. Williams, China. 2007. Bangkok encounter. Lonely Planet guidebooks. Footscray, Vic: Lonely Planet. All links retrieved May 11, 2016. This page was last modified on 11 May 2016, at 14:33.